The Blucore Corsuit is built for swimmers, and is most useful in the water. However, as a postural feedback tool, the Corsuit has application outside simply the pool. Many activities has similar postural requirements to swimming, and therefore can be enhanced with the use of the Corsuit. The Corsuit is particularly effective in improving freestyle body position and alignment. The Corsuit helps the swimmer maintain a tall, flat and hydrodynamically efficient position while swimming, which can have a huge impact on freestyle speed. In freestyle, it is important that the athlete acts upon the feedback provided by the Corsuit. If the swimmer can respond and achieve a Flat Spine position where the back is fully in contact with the Corsuit, they will be positioned in an ideal freestyle posture. Similarly, the freestyle kick can also adversely affect posture. As force is applied, there can be a tendency for the lower back to arch, as a reflex to “help” the kick, but instead pulling the body out of alignment.Athletes should instead practice a smooth kicking motion with no pauses, while the core remains braced. The leg should remain straight during the up-kick, then bend slightly during the down-kick, creating a whip-like action.If the swimmer can respond to the feedback of the Corsuit, and maintain a stable posture while pulling and kicking, speed and efficiency will be increased, as power is better transferred through the core. As in freestyle, the Corsuit helps backstrokers remain aligned through the entire stroke. In backstroke, however, the swimmer should aim for a Neutral Spine position, rather than a Flat Spine. Because the swimmer is facing up instead of down, the back of the hips play a larger role in the kick than they do in freestyle. Because the shoulders have comparatively limited range in backstroke, swimmers will often over-rotate and ‘snake’ from side to side. When this occurs, the athlete can feel the Corsuit moving sideways on their back, alerting them to fact that they are snaking. In this way, the Corsuit helps the swimmer maintain control through the core, keeping the body straight and reducing drag. Simultaneously, the Corsuit allows full range of movement in the shoulders, which accommodates a strong pulling position. In breaststroke, because swimmers must raise the head and shoulders in order to breathe, they are often prone to hyperextension/overarching of the back. Hyperextension of the back means the swimmer moves towards a vertical position in the water, which is hydrodynamically inefficient. The Corsuit alerts the swimmer to any such movement, as they will feel an increased pressure from the top of the Corsuit. This reminds the athlete to maintain a flatter position as they breathe, helping to maintain forward momentum despite some upward movement. As the swimmer then reaches forward and initiates the kick, the back flattens and they move towards a Flat Back position for the glide phase. As in breaststroke, the Corsuit helps prevent hyperextension of the back in butterfly, promoting a streamlined stroke. Even more so in butterfly, the head should be kept low while breathing, which is encouraged by the tactile feedback provided by the Corsuit. Furthermore, during the butterfly down-kick, the swimmer should move into a Flat Spine position, allowing the hips to generate maximal power. To do so, the swimmer should feel the back flatten completely against the Corsuit as the legs drive down. As highlighted previously, this Flat Back position in the down-kick will alternate with a Neutral Spine position during the up-kick. 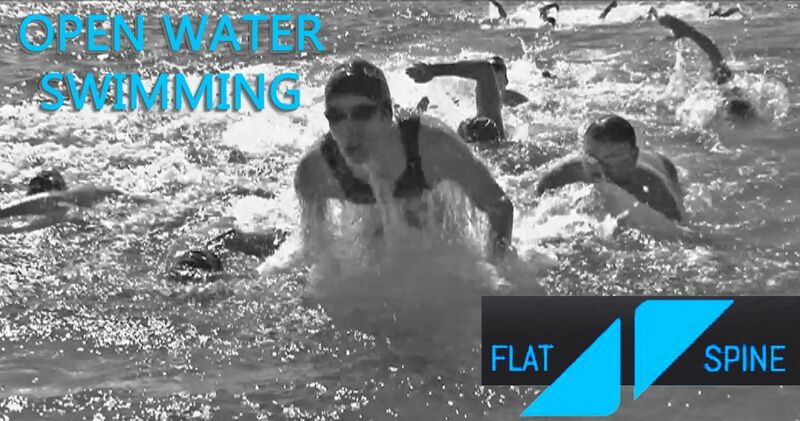 Given the long periods of swimming during Open Water events, efficient alignment can have a drastic effect on overall performance. A swimmer who can create less drag will more easily keep pace, meaning they may be capable of retaining more energy for a sprint finish, or for pulling away from competitors as the race progresses. 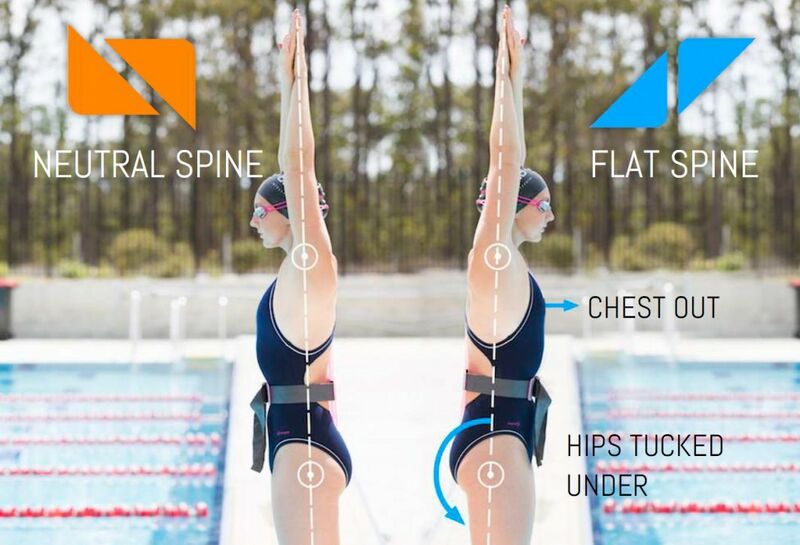 The Corsuit offers a method of monitoring alignment over the course of long training sessions and prompting swimmers to habitually maintain posture for long periods of swimming. The benefits of efficient posture in triathlons are similar to those in Open Water swimming events, but can be amplified by the necessity to conserve energy for the bike and run legs. Triathletes come from many different backgrounds, but are most often biased toward one leg more than the remaining two. For athletes coming from a cycling or running background, this means that swimming posture is often particularly unfamiliar and difficult to achieve. These athletes often have a natural inclination toward anterior pelvic tilt, favouring the muscles at the back of the hips. For this reason, the tactile feedback provided by the Corsuit can help these athletes familiarise themselves with a more Flat Spine position. Even more so than swimmers, triathletes should strive to become familiar with both Neutral Spine and Flat Spine positions, and to move between these with ease. By doing so, the muscles at the front of the hips can be favoured during the swim leg, providing additional propulsion while saving the muscles at the back of the hips for the bike and run legs. The Corsuit, as a swimming posture training tool, also has application outside the water. Many coaches and swimmers apply the Corsuit to their dry land / strength and conditioning training, in order to focus more intensely on posture and cement these skills. 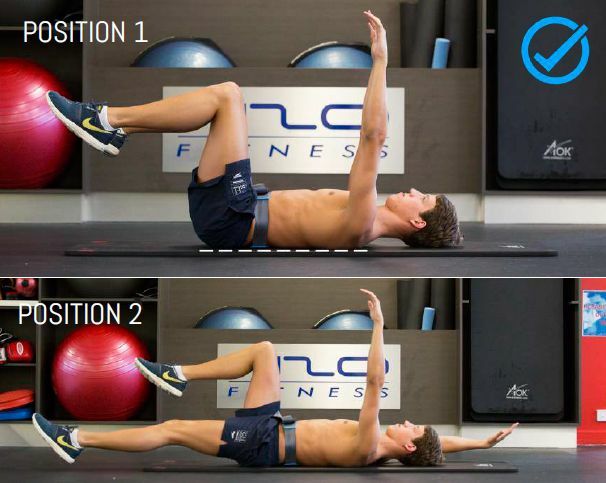 Advanced swimming should be built on a foundation of movements, which require a foundation of positional awareness.By using the corsuit to brace in common swimming positions such as the streamline, the athlete will become more comfortable in these positions while swimming, as well as more capable of maintaining efficient technique under fatigue. The photo to the left shows an an example of how to adjust from a neutral spine position to aflat spine position. The bridge (or ‘plank’) is a common exercise in swimming, but is difficult to perform correctly. The Corsuit aids in refining the bridge position by ensuring any hunching and/or arching is minimised. In doing so, when the hips are tucked under the core is activated more strongly, increasing the intensity and specificity of the exercise. The Bird-Dog is a low-impact awareness exercise, intended to help swimmers improve proprioceptive awareness of their arms, legs and posture. To perform a Bird-Dog correctly, the core should braced in Position 1, with the back flat against the Corsuit. As the legs and arms extend towards Position 2, the back should remain flat against the Corsuit. The Dead Bug is an advancement upon the Bird-Dog, where a similar movement is performed lying on the back. As with previous exercises, the most common fault in Dead Bug technique is arching of the back. To perform a Dead Bug correctly, the core should be braced in Position 1, with the back flat against the ground. As the arm and leg extend towards Position 2, the back must remain flat, maintaining pressure on the ground. If the back begins to arch, the athlete will feel feedback at the top and bottom of the Corsuit. The Pot Stir is an advanced bracing and control exercise. From a bridge position on a gym ball, the arms perform large circular movements in alternating directions. The athlete should maintain a Flat Spine position throughout the exercise, which requires strong bracing of the core as the arms move. 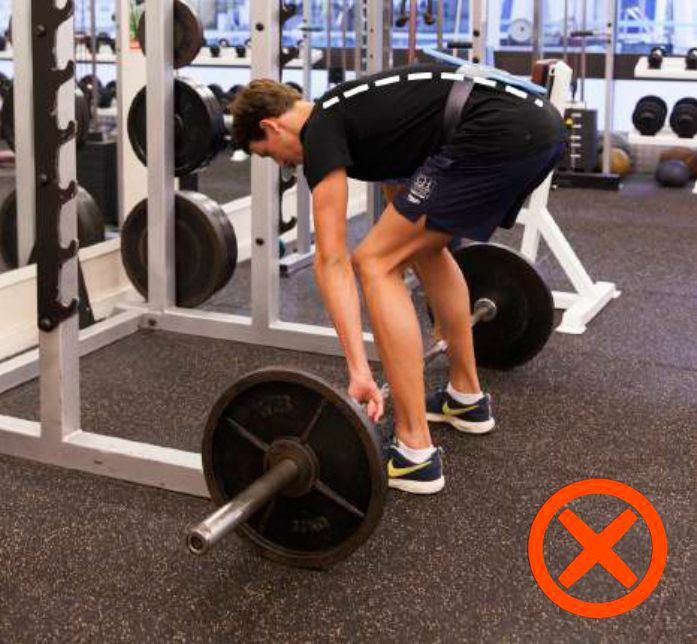 The deadlift is often considered a potentially dangerous exercise, particularly due to the pressure that can be placed on the back if the athlete is in a poorly aligned position. 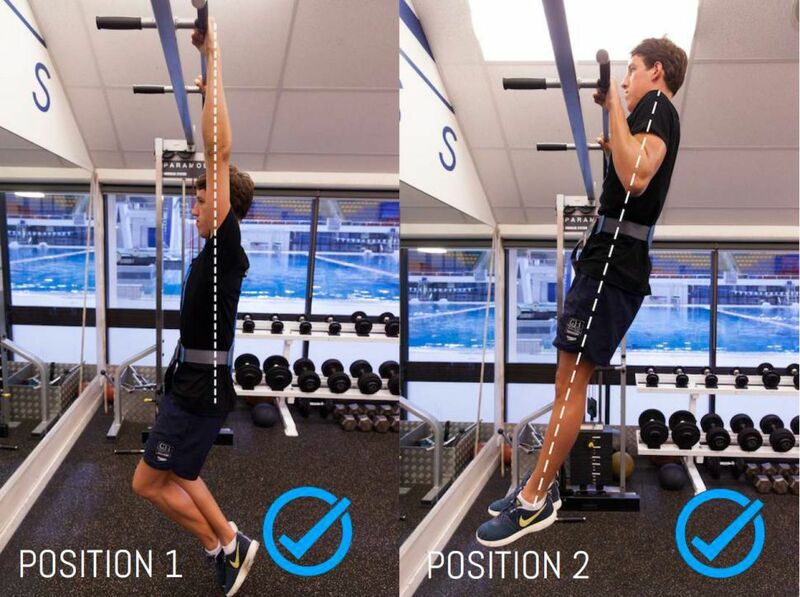 But with proper technique, it can also be highly beneficial for training posture. 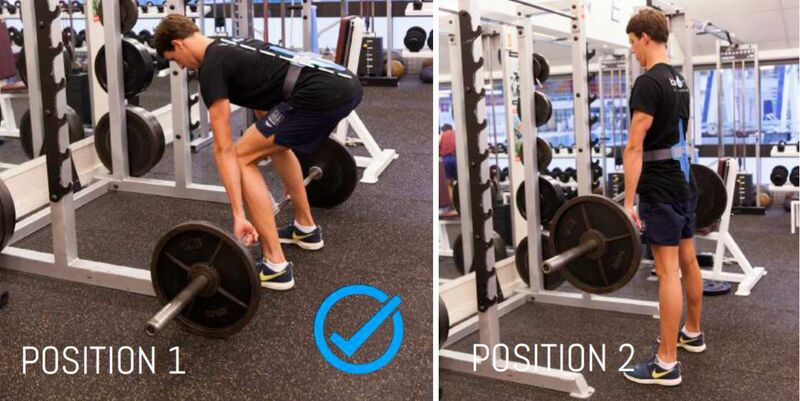 The Corsuit can be used for lightweight warm-up sets to drill an efficient setup position for deadlifting. If the back hunches, the athlete will feel their back separate from the ends of the Corsuit, signalling that they are not adequately controlling the core. 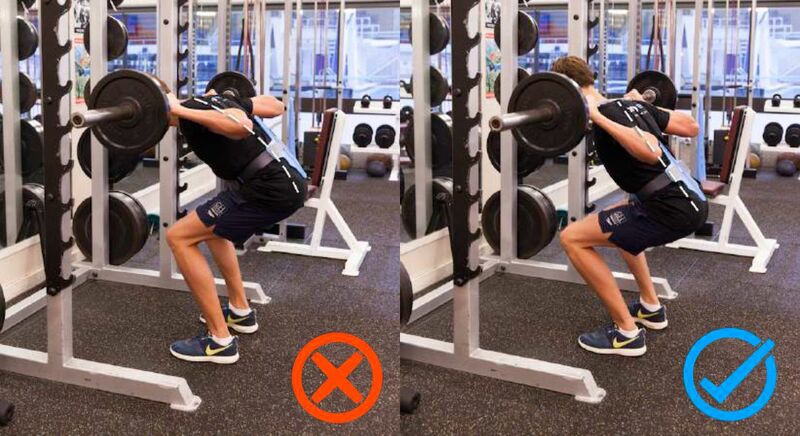 Squats are a highly beneficial exercise for increasing start and push-off power, as well as increasing kicking power. Keeping the back in contact with the Corsuit ensures the hips are kept in a mechanically advantageous position, and the chest is kept up. This closely resembles the position swimmers should aim to achieve when the feet strike the wall during a tumble turn or touch turn. 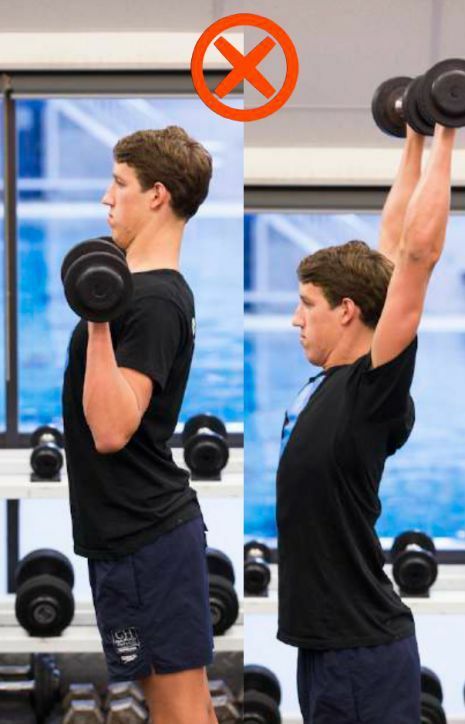 Overhead Press (or ‘Military Press’) can help swimmers with maintaining good posture with the arms extended – for example during streamlining or when in the extended position of any stroke. In a correct overhead press, Neutral Spine is maintained throughout the exercise. 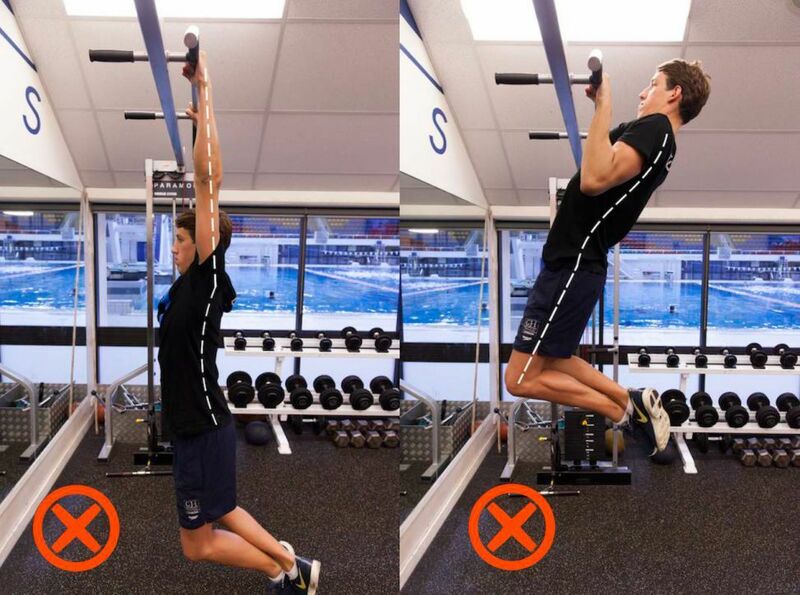 Pull-ups have long been considered the quintessential resistance exercise for swimmers, as the movement is very similar to the pull in swimming. Swimmers should typically perform pull-ups with a Flat Spine, as this most closely replicates swimming technique. 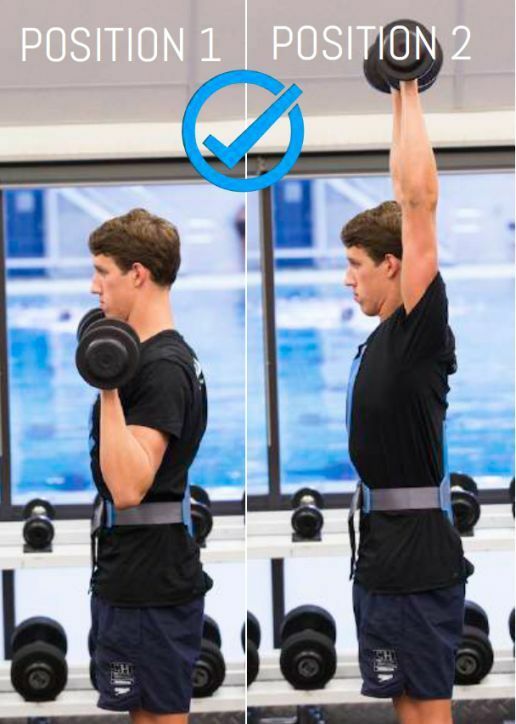 To perform a good pull-up, swimmers should set themselves in a Flat Spine position with the arms fully extended and relaxed. From this position, the core should remain braced as the arms pull the body upwards. The body will naturally tilt as it rises towards the bar, but the bodyline should still be kept straight. The chin should clear the bar to complete the pull-up. At this point the shoulder blades should be retracted, with the shoulders pulled back, preventing rounding of the upper back.